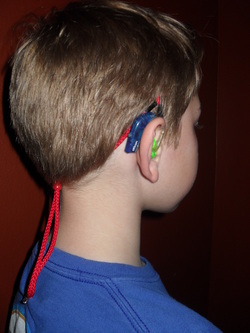 "How can I get my child to adjust to wearing hearing aids?" 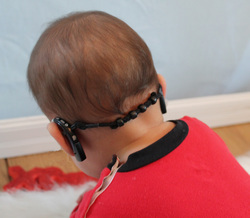 "Is there anything out there that will help keep my baby's hearing aids AND glasses in place?" "What can I do to help my child keep their glasses where they belong?" "Is there anything that will help my senior parents keep track of their hearing aids and glasses?" These are just a few of the questions that we hear everyday. If this sounds like you, You've found the answer! The ORIGINAL, and ONLY Adjustable Retention products for BTE hearing aids, cochlear implant BTE processors and/or glasses are available here! We have been in business since 1997 and we stand by our promises to you, our valued customer! Absolutely the best in hearing aid, cochlear implant and eyewear retention! Recommended by Parents, Audiologists and Eye-care Specialists Worldwide! Guaranteed! will NOT affect the sound quality or clarity of your hearing device!!! Because of our unique design, SafeNSound™ products are not only great for hearing aids or glasses, they're great for those who wear both; no adjustments needed to change wearing style; this applies to cochlear implant BTE processors as well!!! Our Clipz™ are adjustable and attach to clothing, Our Strapz™ are adjustable and independent! SafeNSound Single Clipz™ are great for those who wear only one BTE (behind the ear) hearing aid or BTE Cochlear Implant Processor. SafeNSound Barrettz™ were designed with girls in mind and are absolutely perfect for those with Aural Atresia/Microtia since they are held close to the head independently. Ask your eye-care or hearing health care professional to carry SafeNSound™ products in their office if they do not already carry them! Our no hassle return policy guarantees that if you are not satisfied with your purchase for any reason, just contact us within 30 days from the date of original invoice and we will refund your purchase price (less shipping) via your original payment method. ALL of our products are WARRANTED FOR ONE FULL YEAR against manufacturer defect for one full year from date of original purchase. We promise an easy replacement process. You can also leave us a voicemail after hours and we will return your call as quickly as possible!